The following is an unscripted real world internet conversation about this 1973 Triumph Stag (offered for $1999 in SLC, UT) between DT's CFlo & tipper extraordinaire Zach. Zach: Somebody else's problem can now be yours. Engine inclusion unclear. That said, may clean up well. What engine would you put into it? CFlo: "Somebody else's problem can now be yours!" That should be the headline of every used car ad, ever. Zach: In this case, I don't think the engine replacement answer is M.I.A.T.A. - perhaps a nicely tuned S52 would be akin to what the factory dreamt of? A Yamaha SHO V8 to at least keep the cylinder count the same? Some Ford V6 since the PPO had mocked it up? CFlo: I would go with the BMW straight six, for sure, over any of those other options. Interesting tidbit is that BMW currently owns the rights to the Triumph automotive brand through its '90s purchase of the Rover Group. Even though it sold MG, Rover, Range Rover, etc...it kept the rights to MINI, and also Triumph and Riley, strangely. Zach: As a once and future Triumph owner, I can't wait for them to revive it and then embiggen the cars, a'la the Mini. I think we've just about got the post written for this one. Just need to add the snarky closing - See another heart transplant candidate? CFlo: BMW is running out of body styles and variations thereof. After they introduce the Mini Hugh Jackman All5 Qdrive65h, they will have no choice but to resurrect Triumph and start all over again! Zach: (I may be wrong) They haven't done one with a targa, no, Surrey top, have they? But yes, BMW, meh. They make some great cars. They are now well down the road to achieving their full Pontiac potential of a car in every pot. That 5 series GT still makes me throw up in my mouth a bit every time I see it. 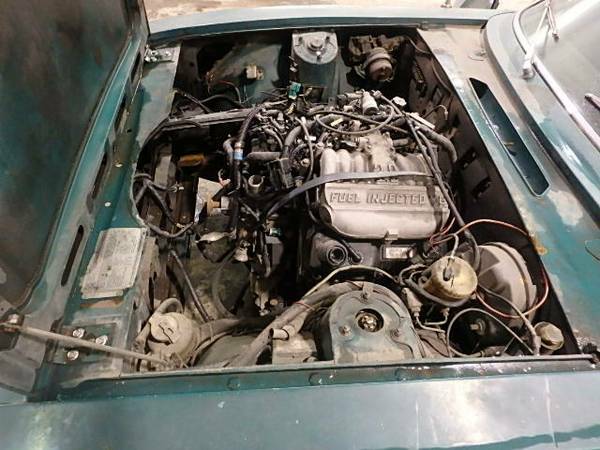 How about a Land Rover 3.9 or 4.6 V8? Both right cylinder count and parent company. Fit it with a pair of SUs or a period correct four Weber setup and you'd have a very intriguing what-if. 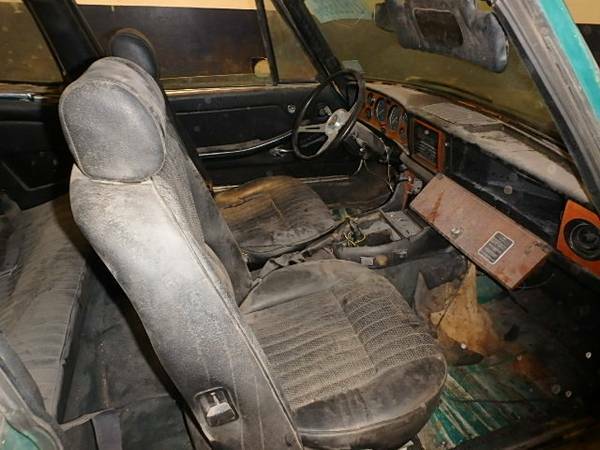 Maybe current owner,who has never seen the car in the flesh,was drunk bidding on ebay and bought this crime scene of a car then sobered up and said wtf omg nonlol I better sell it quick before my wife finds out. (Obligatory Lucas self igniting wiring joke here). Just no. 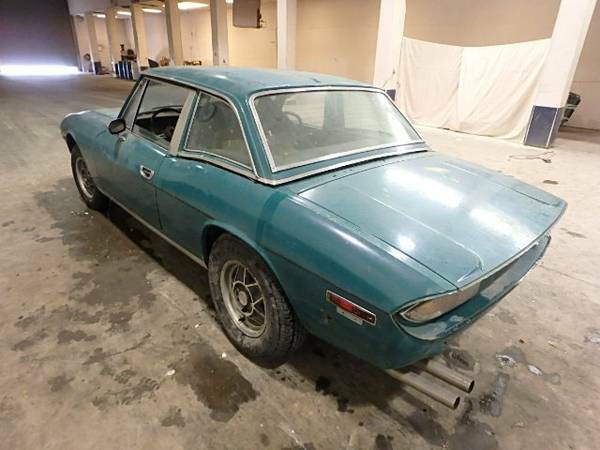 British cousin of the green Fiat Dino? How about one of those "Painless" or similar hot rod wiring kits? Rip out all the Lucas stuff and rewire the whole car as if you just built it from pieces of '32 Fords and '57 Chevys. I get the feeling that modern reliable electrics and a modern reliable powerful drivetrain would solve lots of issues here. Rover / Buick V8 would be sweet. On the BritishV8 website there is a listing of several V8 conversions completed and running in these cars. Everything including generic Chevy 350, Chevy 5.7 EFI, Ford 5.0L. Triumph 3.0L and Rover 3.5L. Transmissions are both auto and manuals, 4 and 5 speeds. Generally I am a proponent of keeping cylinder count the same or higher, but with the coming of the eco-boost from Ford and Chevy where 6 cylinder engines can obtain power levels exceeding generic 8 cylinders, why not drop one of those in and maybe a six or eight speed transmission. I’m thinking there would be plenty of power for performance from the line and track duty and be able to cruise the highways with ease. Am I to far off? This looks great with the bumpers off too. Tough call between this and the Matador. Poor, ill-fated Stag. Supposedly they have the engines sorted out in the UK. Forty years of development later. A BMW Z4 drive train? These are sweet looking with the hardtop on. Kind of odd otherwise, to my eye. Yeah, with a few cooling system fixes, the two-slant-4s = 1 V8 issues are resolved and the engines are purportedly quite nice. That said, the original Triumph block appears to be long gone. And Tom, I agree, these look great with the bumpers off. Honestly, if you gave this thing a wash and wiped down the inside, it wouldn't look nearly as crime-scene. What are you talking about? The engine in the Stag died with it. It is not still in production. This is not the same engine that was in the Rover V8 cars of the time and is still in use in Land Rovers today. It was an engine unique to the Stag. The engine in the Land Rovers started out as an aluminum Buick V8 that was sold to Rover. 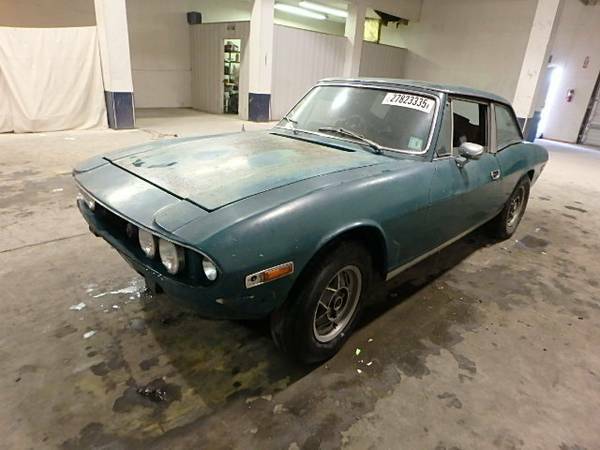 The Stag engine was engineered from the Triumph Dolomite 4 cylinder. I knew a guy who got 1/10th of the way through a sbc swap on one of these before he dropped it for another project called "fatherhood." Man, some people have weird priorities.